by reducing the crowd of the customer and reducing the waiting time also. The system automatically assigns the token nos to the vacant counters(when counter unit is enabled ) as it is preprogrammed . The smooth working of the system has got lot of appreciation from the customers. The microcontroller based software has been designed perfectly to suit the bank requirement after the full study about the bank working phenomenon. 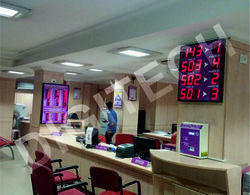 Looking for Bank Q Management System ?